“That wasn’t my last pennies …,” said Jonathon Simmons, with a small chuckle, to a room full of reporters. After the San Antonio Spurs’ 136-100 blowout loss to the Golden State Warriors in Game 2 of the Western Conference finals on Tuesday night, a reporter asked Simmons about the $150 registration fee he spent to try out for San Antonio’s D-League affiliate in 2013. Simmons, who went undrafted in 2012 after playing for two junior colleges before a one-year stint at the University of Houston, was impressive in the audition and made the team. Two years later, he made his NBA debut in 2015 with the Spurs as a 26-year-old rookie. He hasn’t left the league since. Jonathon Simmons (No. 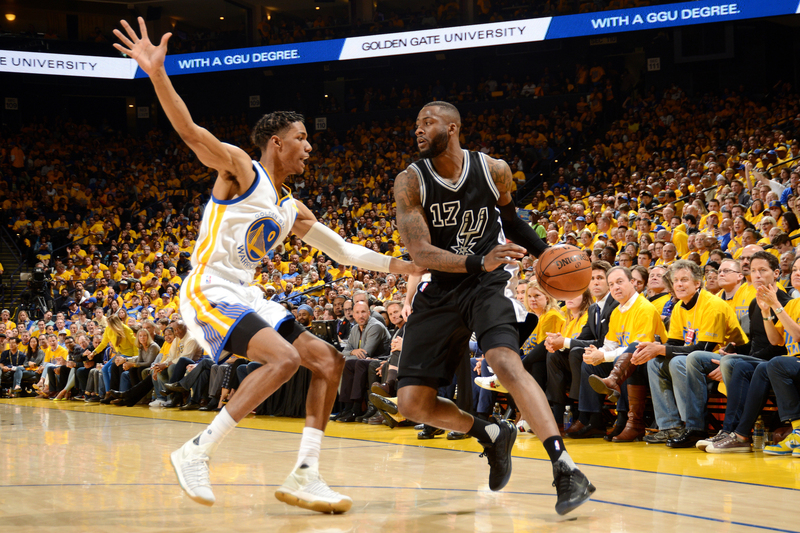 17) of the San Antonio Spurs handles the ball against the Golden State Warriors during Game 2 of the Western Conference finals May 16 at ORACLE Arena in Oakland, California. The tale of Simmons’ $150 tryout, which his former D-League coach Earl Watson called the “greatest story in basketball” in early 2016, has been told countless times. But every time Simmons has a big game, the story comes up again — still as refreshing to listen to as the first time. At halftime, Jonathon Simmons has 17 pts. At a 2016-17 salary of approximately $875,000, Simmons is the fourth-lowest-paid player on San Antonio’s roster (even behind rookie Dejounte Murray). But the 27-year-old will become a restricted free agent this summer, and regardless of whether San Antonio decides to re-sign him or let him test the market, Simmons’ heart and intensity will certainly turn those pennies into millions.